Journey back to Velesi and join Tharin, Lily, Tolan, Julia, Alorn, Mellis, Ziri and Cessa to save the realm and maybe have a wedding...or two, but then again, it is Velesi...so maybe not. 1. How did you come up with the idea for the Velesi trilogy? I was actually working on another YA paranormal story of demon hunters, but I had a huge writer's block. Usually to get me going again I visit the nearest bookstore and lose a week reading 4 to 5 books. But this time, I searched through boxes of books in my garage and found Tad Williams'first book of his Memory, Thorn and Sorrow Trilogy, The Dragon Bone Chair. I had read that book when my daughter was in diapers and she's now in her mid-twenties and happily married. I remember thinking, elves...almost always the secondary, seldom the lead. So I wanted to write a book I could read where the main characters were elves. Before I knew it, I was back at my computer and The Binding was born. 2. Why did you name the first two books The Binding and The Drifting? When I first wrote the first book, I had no title. I called the manuscript Alice for the lack of a better name. It wasn't until I wrote the scene where Tharin used the Binding to save Lily. I knew then, that would be the title. As for The Drifting, I knew in the second book I wanted Tharin and Lily to be separated by their circumstances, but I wanted there to still be a way for them to stay connected. In The Binding, Tharin tells Lily how they are able to leave their bodies to search ahead. They call it drifting because it's like drifting in a dream. 3. What inspired you into creating all the main characters and their different personalities? I knew what I wanted from Tharin before any other character, including Lily. I felt Tharin being Tharin help create and strengthen Lily's own character, along with the others who revolve around him. I base Lily's physical character on a student of mine from a few years back. She was the sweetest girl who never spoke a word, but her eyes (which were amber)...there were dreams, adventures and a beautiful being behind those eyes. Once I had that, it was easy to bring her to life. 4. When did you first know you wanted to become an author? I don't know if I can pinpoint the moment I wanted to become an author, I think for most, it just happens. For myself, I used writing to escape, to express and to co-exists at a young age. Throughout my life writing has always been there to give myself a break when I need a time out from real life. Until one day my daughter made a comment that I should either published one of my stories, or create a whole new one and put it out there. And, so I did. 5. How did you come up with the design of the beautiful covers for these three books? I knew I wanted the covers to have Lily and Cessa on each one. The cover for The Binding was created by a designer by the name of Majanka Verstraete from Austria. Really lovely person and she was great to work with, unfortunately, I lost touch with her and after several attempts I decided to go with another designer for books 2 and 3. Char Adelsperger designed The Drifting and The Whispering based on the cover of The Binding. She did a great job, and I was very please with the end results for both books 2 and 3. If anyone is interested in contact Char, she can be reached at authorcharmarieadles@ymail.com. 6. 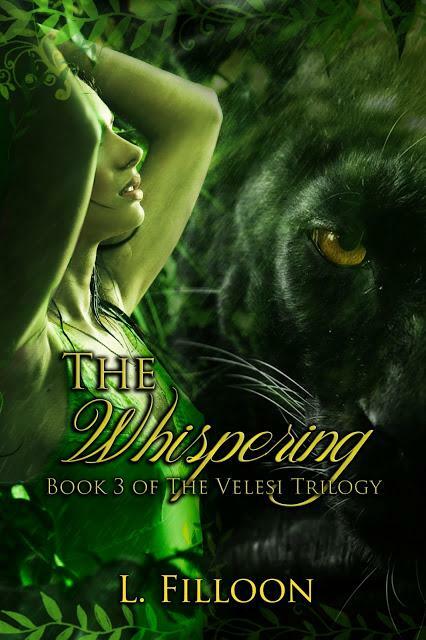 In the third and finale book "The Whispering", will Tharin finally realize that he is meant to be with Lily and can we expect more twists and turns in their relationship? I believe Tharin knew before Lily that they belonged together. Any issues in their relationship in book 3 will mostly be on Lily. Any twists? Hmm, maybe. 7. Will all the mysteries in the first and second books be revealed and if you can without giving anything away, will the ending be a happy or a sad one? I believe a story never ends, even if the book does. So, is there a happy ending or a sad one? I don't know...I finished the trilogy, but their story is still moving along. I want to say a HUGE thank you to L. Fillon for taking time out of her busy schedule to answer my questions. I hope everyone starts reading this book and if you started the series, the finale book comes out July 27. I wanted to stop by and thank you personally for a great interview and thank your members for taking the time to read it. Also, I so appreciate your continuing support of The Velesi Trilogy, and I look forward to chatting with you again! I wanted to tell you a big thank you for taking the time out of your busy schedule to do the interview. It was an honor and I am glad that you liked my review. It was my first one and I was nervous. I can't wait to finish the final book and see how it all ends.